Youngster Darren Moss may be heading for a weeks trial at Barnsley. Tykes manager Harry Bassett has been in touch with City manager Graham Barrow. Speaking in the Evening Leader Graham Barrow said: "He's (Darren) been in limbo this summer and getting away for a week and working with Harry Bassett will be a great experience for the lad. Harry's got a great reputation in the game. I know that and so does Paul Beesley, who played under him at Sheffield United. It's up to Mossy whether he wants to go. He's ambitious as any young player would be. But this offer would be good for the lad." Postcript: Looks like the trial may be off as Mossy says he wants to stay at the Deva. Tony Hemmings has had his contract cancelled by the club with one year to run on it. Hemmings failed to turn up for training last week claiming he was ill at the time. He has been in contact with the PFA stating that the club have failed to honour certain parts of his contract. He also said he was "relieved to be leaving the club." Postcript: Hemmings in fact turned out for Carlisle United on Saturday in their 4-0 defeat by Walsall and may be teaming up with Ian Atkins again. Congratulations to City youth player Lee Woodyatt. The promising left back has been called up by Wales and named in the squad for an under-16 tournament in Northern Ireland. The Welsh team will play Leeds United, County Down and Rimini. Both Dean Greygoose and Notts County trialist Craig Gaunt are due to play for City at Aberystwyth tomorrow, with Gaunt expected to sign for the Blues soon after. Gaunt, who was once a youngster on Arsenal's books, has already had a taste of Conference football having previously played for Kettering Town. Angus Eve is back from duties with Trinidad & Tobago but won't take part tomorrow. Meanwhile, admission to any part of the ground for Tuesday's home match with Bristol City is £8 for adults and £4 for senior citizens and children. Note that the kick-off time is 19:00hrs (are we saving on the floodlights?). Director Paul Murray has resigned from the board at Chester City stating: "a difference of opinions with Terry Smith over financial matters" as his reason. "As of Wednesday 26th July, I have resigned my position as a Director of Chester City Football Club Limited. My personal goal in taking on this role, was to utilise my experience of over 20 years as the managing director of a subsidiary of a large Multi National Company, to the benefit of the club, as well as providing up-to-date business systems and procedures, to enable the club to be run more efficiently than in the past. My decision to resign was made with great reluctance, and was due to a difference of opinion with the chairman, relating to a financial matter at the club, which I felt made my position untenable. I would like to take this opportunity of thanking everyone who has supported me in the work I have been involved in at the Stadium, whose support and valued assistance, has helped me tremendously, during a very difficult period. I would like to make it clear that my support for the football club remains undiminished, and I will assist the club in any way I can in the future." Terry Smith added: "I'm disappointed that Paul is going because he's done a huge amount of work for the club. I understand he's issued a statement saying it was a difference of opinion between me and him but it's not a major issue as far as I'm concerned." "We'd like to thank Paul Murray for all the work he has done," said an ISA spokesman. Club chairman Terry Smith has agreed to speak at the ISA members meeting on Thursday 3 August. The venue will be the Deva Stadium, not the Royal Mail Club as stated in the Chester Chronicle, and Graham Barrow will also be in attendance on the night. The meeting starts at 19.30hrs. Goals from Darren Wright and new signing Scott Ruscoe, a belting 20-yarder at that, gave Chester a 2-1 victory at Canal Street in a good competitive friendly match with Runcorn last night. City gave a trial to ex-Northwich and Crewe Alex 'keeper Dean Greygoose. Congratulations to the Chester Ladies football team who won the Manchester Umbro On The Ball Tournament held over the weekend. Chester beat Trafford 3-1 in a penalty shoot-out to take the trophy. The team kick-off their North West Premier Division campaign in September. If anyone can send me fixtures and team details/match reports I'd be more than happy to include them on this website. Chester drew the first game of their pre-season warm-up 1-1 at Connah's Quay. Mark Beesley equalised for City on his debut with about ten minutes remaining after Steve Futcher had given Nomads a first half lead. Chester play at Runcorn tomorrow night in their next warm-up match. Ex-City player Shaun Reid is currently on trial at the Canal Street club and may turn out against The Blues. The club have signed a deal with car hire company Drive UK to provide a car for manager Graham Barrow. This is no doubt to replace the battered eight year old Peugeot bought for Barrow by the commercial manager at a local car auction for the price of £350, as reported in today's Sunday Express. As rumoured in recent days, Chester have gone back on their decision to drop admission prices for the coming season. Matchday admission will now remain the same as last season in the Football League and will be amongst the highest in the Conference. Season Ticket prices are unaffected. Terrace: adults £10, senior citizens & unwaged £7, under 16's £5. East (main) & West stands: adults £12, senior citizens & unwaged £9, under 16's £6. Explaining the increase chairman Terry Smith said: "Reducing the prices was a hasty reaction to being relegated. We wanted to do something positive for the fans, but in fact, we are running a budget for next season which is higher for most of last season. If I was a fan I would sooner pay last season's prices and have a club to support." Obviously with next seasons budget in mind the chairman has decided to change the way the players salaries are being paid. Several players have complained to the PFA after finding only two weeks wages in their July pay packets. The players, who weren't warned about it, are to be paid every fortnight instead of each month. One said: "It's not gone down too well with some of the lads, especially those who've got mortgages. If that's the way he wants to treat people, then it's quite a shock. The one thing the club needs right now is to keep the team upbeat ahead of the new season." Smith hit back saying: "The club can pay how it chooses. It makes more sense at this time of the year because so many players are joining and leaving. If a player has a problem my door is always open." City's first pre-season friendly takes place tomorrow with a visit to the Deeside Stadium to play Connah's Quay Nomads. (ko 15.00hrs). This is followed by a match at Runcorn on Tuesday that has a 19.30hrs kick-off. Expect City's new signings to feature in these games. According to today's issue of The Non-League Paper, Doncaster Rovers Tunisian u-21 international 'Deano' Noureddine Maamria is having transfer talks with Chester and Southport this weekend. The striker who scored 14 goals for Rovers last season was released from Belle Vue last month.With Wayne Brown suspended for the first three games of next season  and still to sign a contract, Barrow has invited ex-Port Vale shot stopper Paul Musselwhite to train with City. Dean Greygoose, ex-Crewe has also been seen at the Deva. He played for Altrincham last season. The next ISA members meeting will take place on Monday 24 July at the Royal Mail Club, Station Road, Chester, starting at 19.30hrs. The guest speaker has yet to be confirmed. The home game with Kettering Town has been put back 24 hours to Sunday 8 October kick-off 14.00hrs, while the away match at Nuneaton Borough has been brought forward to Friday 23 March kick-off 19.45hrs. The date of the Exiles annual general meeting has been put back three weeks and will now take place on Thursday 10 August at The Windmill, 6-8 Mill Street, London W1 starting at 19.00hrs. All members are encouraged to attend. Gordon Hill has been appointed as Youth Development Officer at the club. He has been coaching in the USA and has been a friend of Chester’s owner Terry Smith for years. Angus Eve, currently on the transfer list at Chester, has now equalled the record as the club's most capped player, that record is currently held by Billy Lewis who played 13 times for Wales. Eve will probably beat the record next week as Trinidad have World Cup qualifiers against Canada (July 16th) and Mexico (July 23rd). Eve has scored 4 goals in 13 appearances for his country. Chester have signed former Wrexham and Shrewsbury player Dean Spink on a two year contract. 33-year-old Spink began his career with Halesowen Town before moving to Aston Villa (£30,000), Scarborough (loan), Bury (loan), Shrewsbury Town (£75,000) and Wrexham (£65,000). Spink scored 9 goals in 85 appearances for Wrexham before being released at the end of last season. He has spent some of the summer at Lilleshall's National Sports Centre recovering from a cartilage operation. "The manager has said that the first two games of the season will give us an indication of how we're going to get on but there's no reason why we can't do well," he added. City have also signed 25-year-old midfielder David Kerr from Mansfield Town. Kerr played over 80 games for the Stags before being released. Meanwhile former Chester captain Stuart Hicks has signed a three year deal at Mansfield Town. Sad news today as the death of one one of Chester's former great servants Cliff Sear has been announced. Sear died on Saturday at the Countess of Chester hospital from a suspected heart attack aged 63. Player, caretaker-manager, manager, scout, youth team coach  Sear did just about everything at Chester, always in a professional manner and will be best remembered for discovering Ian Rush, and later when at Wrexham, Chris Armstrong. Born near Wrexham, Sear started his football career at Manchester City in 1955 and went on to make nearly 250 League appearances for the team. He won two Welsh caps at u-21 level and a full cap against England in 1963. 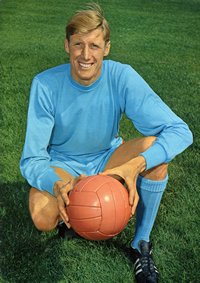 Cliff Sear was signed from Manchester City in 1968 and played 58 league and cup matches for Chester between 1968-70 scoring one goal (on his debut). Following this, Sear became the youth team coach at Chester bringing through future stars such as Paul and Ron Futcher and of course Ian Rush. He was to later become assistant manager to Alan Oakes and took over as caretaker manager in March 1982 following Oakes' sacking. He was appointed manager the following season but relinquished the job to John Sainty in November 1982 reverting to what he enjoyed doing best, running the youth set-up. Sear, who lived at Waverton, left Chester in the early 1990s under a cloud following disagreements with the management and joined neighbours Wrexham where he successfully continued in a scouting/coaching role. Chester have won their case at the Football League in London today regarding their claim that Shrewsbury Town made an illegal approach for Chester’s former coach Dave Fogg. As a result Shrewsbury have been reprimanded. They didn't receive a fine and both clubs have been asked to pay costs. Over recent weeks, Smith had demanded that Shrewsbury be docked three points (therefore saving City from relegation) and had also claimed that the Shropshire club should pay Chester £1m compensation. Today's Birmingham Evening Mail reports that John Gregory may be ready to swoop for City's highly-rated Wales youth international defender Darren Moss. Moss arrived on trial at Villa together with 19-year-old defender Martyn Lancaster a month after the pair impressed Gregory in the Worthington Cup ties against Villa in September. Gergory is also believed to be interested in 18-year-old left back Matthew Doughty, although he has just spent a month in a young offenders' institute for violent disorder after an attack on a teenager outside a nightclub. Moss recently rejected a new five-year deal at the Deva. *Matty McKay actually played 7 league games for Chester before his transfer to Everton on 26 March 1998. City have placed three players on the transfer list. Nick Richardson (left), who still has a year of his contract to run, Trinidad & Tobago International Angus Eve and Tony Hemmings. The club have stated that they will require a fee for Eve who hasn't been seen at the club since the end of last season. As it clashes with the England v Germany World Cup qualifier, City's home match with Kettering Town on 7 October may be brought forward to the Friday evening. Gap Recruitment, a city-based recruitment agency, are the shirt sponsors of Chester City for the forthcoming season. Both Darren Moss and Wayne Brown have yet to sign new contracts for the forthcoming season. Brighton defender Gary Hobson who came to City during Ian Atkins spell as manager signed for York City on Tuesday, while former Blues players Iain Jenkins and Sam Aiston have both joined Shrewsbury Town. Martin Nash is currently playing for Rochester Raging Rhinos (sic) and Joe Carver is with Chicago Sockers. If you know the whereabouts of any other former players please contact club historian Chas Sumner. Tonight's Fans Forum with Graham Barrow has been postponed. No new date has been announced. While the meeting of the Executive club members which was widely reported as being last Tuesday takes place next Tuesday. City boss Graham Barrow is hopeful of signing 19-year-old Mark Beesley, subject to a medical tomorrow; he was released by Preston at the end of last season. Beesley scored 20 goals for Preston reserves last season and has also interested a couple of other Conference clubs. He's been offered a two year deal by Chester. Chester's first-ever match in the Nationwide Conference will be away at Rushden & Diamonds on Saturday 19 August. Doncaster Rovers provide the first opposition at the Deva three days later. Over Christmas and the New Year Chester have reversed fixtures with Hereford United. The season ends with the visit of Rushden & Diamonds to the Deva. Full fixture list. On the recommendation of Colin Greenall, Chester have signed 21-year-old Neil Fitzhenry a 6ft defender from Wigan Athletic. He's been given a three month contract. There is to be a fans forum with Graham Barrow at the Deva Stadium this Thursday at 19.30 (how's that for short notice!). Meanwhile Terry Smith has arranged a meeting for all Executive Club members tonight at the Deva, also starting at 19.30. Chester City will unveil their new shirt sponsors tomorrow. The deal struck by Rod Burton is described by Terry Smith as: 'the biggest sponsorship that Chester City has ever had'. Good luck to Gary Shelton who's been offered a coaching job at West Bromwich Albion. I really appreciate the chance Kevin Ratcliffe gave me of going into management. Although it ended on a sour note, I did enjoy my time at Chester; the playing, the coaching and the support from the fans. Getting to the play-offs was a great achievement but I also enjoyed playing too and scoring the odd goal or two. I think the one at home to Swansea was the best. That's the one I remember most. he told the Evening Leader. Les Smith has resigned as chairman of the Chester City ISA. His resignation was reluctantly accepted by the rest of the ISA committee at a meeting last night. Les will be remaining on the committee though. Secretary Kevin Whitehouse has been asked to take on the role of Acting Chairman until the next members meeting, whereupon he will be seeking the votes of the membership to become the Chairman. Likewise, Alan Case has been asked to become Acting Vice Chairman and he will also be seeking to become the Vice Chairman at the next meeting.The ISA Committee have stated that they would like to place on record their thanks to Les for all his hard work and endeavors during his tenure as Secretary and Chairman of Chester City ISA. Graham Barrow's new assistant manager and central defender is 35-year-old Paul Beesley who played alongside Barrow at Wigan Athletic. The defender, who played 19 games for Blackpool last season, has been given a two year deal. Liverpool-born Beesley, started his career with Marine before moving on to play for Wigan Athletic, Leyton Orient (£175,000), Sheffield United (£300,000), Leeds United (£250,000), Manchester City (£500,000), Port Vale (loan), West Bromwich Albion (loan), and Port Vale. I still want to play but getting involved off the field is something I've been looking at, said Beesley. In the qualifying round for the first round of the AXA F.A.Youth Cup Chester have been drawn away at Doncaster Rovers. The match is set to be played before 2 September. All Nationwide Conference clubs have been given byes to the third round of this year's competition. The football club have announced that the executive club is over subscribed because of limited space, and that the new vice-presidents club, which is incorporating meals next season, is by invitation only.